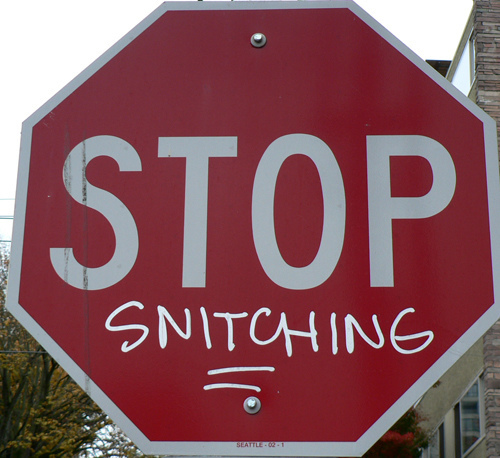 Having spent some of my childhood in the streets, I have a strong aversion to snitching. It was one of the absolute lowest things one could do, the fast track to becoming persona non grata. Part of the reason for this was the dire consequences that could befall the “snitchee”. If one were to face consequences for something they do, then fine, but those consequences were not ours to give. The snitch takes upon them an omnipotent role, one not worthy of respect because it is so cheaply had. Now I am a grown up and have been out of the streets for many years. I understand that, as a teacher, there are times when I might have a legal or moral obligation to play the snitch role. A few years ago, a female student came to me saying that a male teacher had propositioned her. I went straight to the administration. The student could not understand why I was making a big deal about it. I explained that I am a mandated reporter with the legal obligation to report any child abuse. Not only was it the legally right thing to do, but the morally right course as well. Aside from that time, I never saw a reason to march into an administrator’s office to inform on a colleague. Whether I liked a colleague or not, if they were not doing anything physically or sexually abusive to a child, then there was really no reason to inform on them for anything. Just like in the streets, doing so could carry serious consequences. It is not my place to play God with people’s careers. There is also the added reason that teachers are members of the same profession and union. No matter our personal feelings towards a colleague, a sense of solidarity should supersede everything else. As professionals, there is no reason why personal disagreements could not be ironed out face to face. It does honor to the profession to rise above personal animus and find common ground with someone you otherwise do not like. As members of the same union, nothing is more corrosive to workplace solidarity than a schoolhouse snitch. The first year teaching at a new school is always challenging. You have to get used to the students, the culture, the expectations of the administrators and your colleagues. Usually, it requires revamping all of your lessons. There is a learning curve that, by the end of the school year, leaves you exhausted. I once transferred from a school where I was the history department to a place where I was one among many. Instead of making my own curriculum, like I did in my previous school, I had to follow a department-wide curriculum. For the first few weeks, I went through an adjustment phase where, at most, I was off in the calendar of lessons by about a week. My door is always open when I teach. My voice usually resonates across the entire floor, the acoustics of your average school hallway carrying it far and wide. A teacher on the floor, one who taught generally the same courses as me, came into the classroom one day during an off period to tell me I should be an announcer. I had a “nice voice”. I was also “cute”. This was not flirtation at all, just friendly banter. At the end of the first month, it was time for our first department meeting. The assistant principal was not pleased. Apparently, not everyone was following the curriculum. He looked right at me and asked me where I was in the curriculum. I told him an answer he did not want to hear, at which point I was duly reamed. Seeing as how I was never “reamed” before, it was not a pleasant experience. It certainly took me down a notch in front of my new coworkers. A day later, one of my colleagues came to me and said that the “nice voice” and “cute” lady was the one who ratted me out. I did not think much of it, because I was used to colleagues trying to poison my mind against others with whom they did not get along. I thanked her for the information, but quietly suspended my judgment. It did not seem as if she was the type to rat. She was generally personable and had a decent sense of humor. She was also a common malcontent in the teacher’s lounge, deriding the AP as an “idiot” and generally berating everything the administration did. Then, the next school year, I was charged with creating the uniform midterm and final exams for one of the grade levels, the same grade level for which I had been reamed for not following. I wrote up the exams and then emailed them to my colleagues to get their input. No input was ever given, so they were administered to the students as-is. One day, the “nice voice” and “cute” lady told me the AP had reamed her for not handing back the final exams. She said she told him she did not hand back the exams because I used all old Regents questions, many had been recycled from previous midterms and finals. She did not want the answers to the two or three repeated questions floating around for public consumption. I did not realize it until later, but she had pretty much admitted to me that she had, once again, ratted me out. The AP had a “talk” with me about why I recycled the same questions. This time, I did not hold my tongue. I told him that all teachers received a copy of the exams two weeks ahead of time. They had plenty of opportunity to advise me on what they wanted changed. Furthermore, I had submitted each and every exam to him for approval before making copies. Why had he approved exams that had two or three recycled questions if it was unacceptable? I really did not get to say what I wanted to say. What I wanted to say was that quibbling with a teacher over two or three questions was waste of a six-figure salary. It is unlikely that the students themselves would even notice the recycled questions. Even if they did, so what? I made it a point to recycle questions that had been recycled on the Regents exams themselves. You want high pass rates for the Regents, do you not? And, while we are at it, were you this harassing to the teacher who did not hand back these exams to her students? You know, the teacher that could have easily told me to change the offending questions, thereby obviating her need to withhold the results of the exam results from her students? I was taking the fall for something that, in the grand scheme in the educational universe, meant absolutely nothing. On top of that, I was taking the fall for the actions and decisions of other people, especially the person that made the choice to not return those exams. What happened next was the first and only time the street came out of me to a colleague. Shortly after this incident, everyone in the department was in the same room grading Regents exams. The snitch was hovering over me asking what I was doing. I looked up at her and, in so many words, told her not to worry about what I was doing and to go off and find something to do herself. Peppered in those directions were some choice words that the likes of Rahm Emmanuel would usually say, only said with a Brooklyn accent. From that day on, she was a victim. I had spoken to her just terribly and she did not know why. Why not go tell an administrator after you cry in a corner? After a whole school year of not speaking to me, she solidified her position in my mind as one of the most odious people I have ever had the misfortune of working with. One day, another colleague and a good friend had been “rubber roomed”. The accusations were frivolous, a result of a personal vendetta by the administration. The snitch did not get along with this teacher. Once she was rubber roomed, not only did she say that the teacher deserved it, but deserved to be terminated as well. To be sure, what this teacher was accused of should not have been anything more than a letter to the file. If I did not know before, I knew now that this woman had no regard for the careers and livelihoods of her coworkers. Towards the end of my time at the school, the snitch would find reasons to hover right outside my room when I was teaching with my door open. She would make an inordinate amount of trips to the water fountain and seemed to have a very hard time getting the key to the bookroom to work, the bookroom that was right next to my class. She certainly got an earful of history and, who knows, maybe the administrators received daily reports of what was happening in my class. If I was a schoolhouse snitch, I would have had no shortage of ammunition myself. Every single day, this teacher would berate her classes. When we would be teaching the same period, my class would overhear her telling her kids to “shut up”. If it was not that, she would berate individual students for the smallest infractions. She would yell at individual students for calling out, spending more time yelling at the student than the student took in committing the infraction in the first place. In fact, every little thing seemed to set her off. She was always yelling. My students would overhear her and laugh. Every school in which I have worked has had their schoolhouse snitch, usually more than one. Sometimes the snitch is the union leader. Invariably, the snitches are not the most exemplary teachers in the school. They are the ones mired in mediocrity, the chronic yellers and burnouts, the ones who do not give back exams, for example. It is not hard to see why: snitching is the most valuable role they play. It is the teachers who cannot let their work speak for themselves who serve as the snitches. People who are secure in their profession, the ones who take pride in what they do, who have no time or interest in snitching. Now, while the snitch deserves some blame for making the decision to be a snitch, administrators are the ones who create the environment that allow snitches to thrive. It is a common scene in most schools to see the resident snitch sitting in the administrator’s office, speaking in hush tones. It was the AP who decided to ream me out after the snitch had gotten a hold of him. This behavior encourages more snitching in the future. We hear in the media that it is the union who protects bad or incompetent teachers. After 12 years of working in unionized public schools, I have a different explanation for why (the few) incompetent teachers remain in the system: so very many of them are doing petty favors for the administration. There are those few people who have little to offer in the realm of teaching, so they make up for it by undermining union solidarity. Back in the middle ages, it was a cardinal sin for artisans to reveal the secrets of the guild. They knew their livelihood depended on an iron-clad vow of secrecy, lest they open themselves up to competition and get driven out of business. What they produced was craftsmanship that stood the test of time. Masons would adorn the face of each building stone, even the ones that would not be seen by the public, with finely-etched images. After all, God’s eyes were watching. If only teachers would live by that same credo. If only we treated each other like professionals, no matter what our personal issues were. Unfortunately, it only takes one snitch to demoralize an entire staff; one snitch and the administrators that protect them. This entry was posted in An Embattled Career, education reform, School, teaching and tagged education, School, School Politics, Stop Snitching, Teacher Professionalism, Teacher Snitching, Teaching, Union Solidarity. Bookmark the permalink. oh yeah…living this life in my high school right now! Out of the myriad of frustrating and ineffective issues at work, this problem is in my top three for making things unbearable. Admin who salivates with ambition actually refers to his “informants” with a smirk when casting aspersions. Teachers serving as sycophants seem not to be incompetent, but mediocre with a level of unshakable personal confidence. Super fun is the fact that students also are being empowered by admin. to report on teachers!